In its latest retro feature, Revit Building Information Modeling software can now show a view of a design as if it was sketched by hand. I had been long awaiting this. At least twenty years ago, a software called Squiggle cleverly offered to translate the cold hard lines of a design in AutoCAD to sketch form, warming the audience to a more humane presentation of computer aided drafting. What is it about the appearance of less certain lines and more ambiguous images that invite us in, where mathematically perfect lines and images often repel? A sketch is by its very nature spontaneous and rapid. The thought is being born, not dryly reported. The irony of a computer simulated sketch is that its seeming relaxed random line style is strictly proscribed. In Revit’s version the parameters are “jitter”, how the sketcher waves the line from straight, and “extension”, how much the sketcher overshoots lines at intersections. The exact geometry has to come first, not the other way round as in the old school. Long before computers, the original intent of a hand sketch was to quickly, flexibly translate thoughts to paper, the detail not yet completely known. A sketch was an informal study that allowed rapid iteration of ideas that were not predetermined: a stream of consciousness. The sketch invited participation. You could see what you wanted in its more ambiguous play of lines. 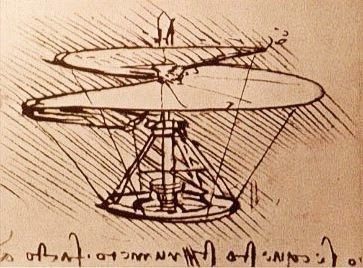 Da Vinci’s flying machine is credible without quibbling about details. 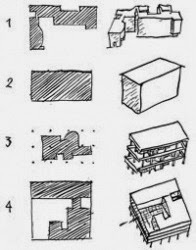 LeCorbusier's classic building typology is appealing and believable, abstracted to basic concepts. Revit’s choice of the word “Sketchy” is perhaps unfortunate, since sketchy thinking doesn't share the trust that the sketch itself does. A sketch can hide things: flaws that would doom the feasibility of a design, or perhaps bring unmerited appeal through “eyewash,” like pretty composition or shading; a cloud or tree in the right place. The architect’s “napkin sketch” is famous: the miraculous birth of the design. More often, though, this clarity comes as the design evolves and is refined. Often the great napkin sketch, the parti of the building, is hand traced over the final design drawings, much as Revit abstracts the sketch from a set of hard lines. I tried my hand at input of concept using Revit’s new “sketchy” interface myself, rapidly outlining a series of walls and roofs to form trial concepts for a new building. It was freeing, but was I fooling myself?. Even as I was able to stay in scale and form spaces to the needed sizes, as is only possible with some level of automation, I did experience more flexibility, less focus on distracting detail. Hand sketch advocates on the team brightened up and felt more relaxed in offering ideas. The design came together. Magic? I've been continuing my quest to develop concepts with Revit sketchy lines. Sketchup is way ahead of Revit on this, but sacrifices practical control of the model in the process. Someday the two will come together.